Anotaciones al margen: Chasing the Ghosts of Franco. Chasing the Ghosts of Franco. In the summer of 1936, a fascist military coup led by Francisco Franco put an end to the democratic Spanish Republic that had been established in 1931. During and after the Spanish Civil War, which began in 1936 and ended in 1939, more than 120,000 people were slaughtered by Franco’s forces and buried alongside roads and in fields. These people did not fight on the battlefield; they were simply arrested and killed for having political ideas that conflicted with those who led the fascist uprising. School teachers, farmers, doctors and laborers were all executed and buried in mass graves. 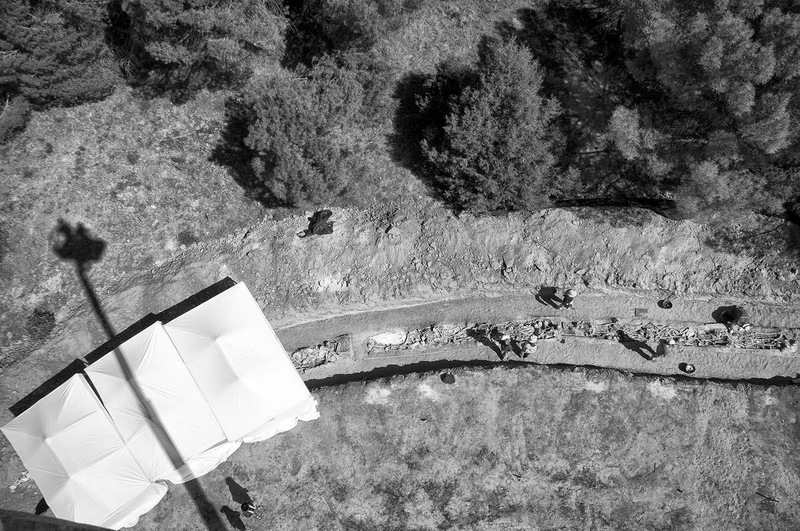 An aerial view of the La Legua mass grave. From above, it’s possible to see almost the entire grave, which contains fifty-nine victims of a firing squad. Volunteers at the site of a mass grave in La Carcavilla park in the city of Palencia. This mass grave contained the remains of six people from the town of Gormaz in the province of Soria. Forensic anthropologist Francisco Etxeberria coordinates the movements of volunteers who recreate the positioning of the bodies in the grave. According to survivors from the time period, there should still be four more victims in the mass grave that are yet to be found. These victims belonged to CNT, the Spanish anarchist union. The bodies of thirteen victims were recovered more than seventy-five years later in the La Mazorra mass grave in Burgos. They were executed by firing squad with their hands tied, without a trial, for the crime of refusing to support General Francisco Franco's fascist coup de d’état. The bones of those killed are analyzed in order to confirm their identities. They are then returned to their families, who decide how they will be reburied; in some cases, in cemeteries erected on the sites where they were murdered. Currently, the exhumation of mass graves is virtually paralyzed due to an elimination of all public funding by the Spanish government, which has cited the economic crisis as the primary reason for not supporting victims' attempts to recuperate historical memory and recover the experiences of the fallen. Luisa, who is eighty-eight years old and recently arrived from Paris, hopes to find the remains of her father buried along with ten men and two women. On November 18, 1936, in the Valdivieso valley, the Falangist party organized the illegal removal of prisoners from Villarcayo prison. These prisoners were from the neighboring village of Merindad de Sotoscueva in Burgos. They were executed and Luisa was orphaned and left in the care of her siblings. The bodies of these victims have remained buried in the Puerto de La Mazorra, less than 200 feet from the Burgos-Valdenoceda highway. Relatives of the victims of reprisals observe the early stages of the exhumation of more than 250 victims who were executed and buried in what is now La Carcavilla, a children’s park in Palencia. One of the volunteers from the Sociedad de Ciencias Aranzadi (Aranzadi Society of Sciences), searches overturned dirt for metal objects: bullets, belt buckles, coins–anything that might indicate this is the site of a mass grave containing the remains of reprisal victims. On the left, Lourdes Herrasti, an osteoarchaeologist, talks to another volunteer. The site of the La Mazorra mass grave, a wheat field along a highway in Burgos. The majority of the mass graves are found in similar areas, including ditches along local highways. Forensic anthropologist and president of the Sociedad de Ciencias Aranzadi, Francisco Etxeberria, makes his way to a mass grave containing the remains of thirteen execution victims. Luis and Ana, volunteers for the Sociedad de Ciencias Aranzadi, meticulously work to recover remains from the La Mazorra mass grave. Metal crucifix found among the remains of one of the execution victims–likely a priest. Relatives of the victims of reprisals carried out during the Spanish Civil War arrive at the La Mazorra mass grave in Burgos to aid in the identification of their murdered relatives. Relatives of the disappeared wait in the rain by the mass grave to provide descriptions and DNA samples for comparisons with the remains found in the grave. Documentation presented by the relatives of the disappeared to the Aranzadi Society of Sciences to help identify the exhumed bodies. Remains from different exhumations are piled in the laboratory of the biology department at the Universidad Autónoma de Madrid, waiting to be identified and returned to their relatives. Christian burial of a father and son who were murdered more than seventy years ago. Their bodies were exhumed from the La Legua mass grave, identified and returned to their relatives. "Los tanques rusos tienen un 25% de descuento"
¿Está Europa a la altura de Ucrania?